A Jewish film festival has been kicked out of its home at a London theatre after the venue refused to host an event with sponsorship from the Israeli government. Protesters at the Tricycle Theatre in London. The UK Jewish Film Festival, which has programmed 26 films for its festival in November, has been hosted in part at the Tricycle Theatre in Kilburn for the past eight years. Indhu Rubasingham, artistic director of the Tricycle, said the cinema had offered to host the festival and to add more funding on the condition that the sponsorship from the Israeli embassy was turned down. She told the Jewish Chronicle: "The festival receives funding from the Israeli embassy and given the current conflict in Israel and Gaza, we feel it is inappropriate to accept financial support from any government agency involved. "We offered to provide alternative funding to cover the loss of the contribution from the Israeli embassy. We want the festival. What a shame. I used to have so much respect for the Tricycle Theatre. I can't imagine they would do the same w/ Russians or anybody else. In a statement, UKJFF executive director Judy Ironside said: “The Tricycle told us that they cannot be associated with a festival which in turn is associated with the UK’s Israel embassy”. “That the Tricycle Theatre have shown themselves unwilling to work with what is clearly an apolitical cultural festival is tremendously disappointing. "They have chosen a boycott over meaningful engagement – to the great detriment of this celebration of Jewish culture, which is of course intrinsically connected to the state of Israel,” she said. In a joint statement, two of the UK's key Jewish leaders condemned the decision. 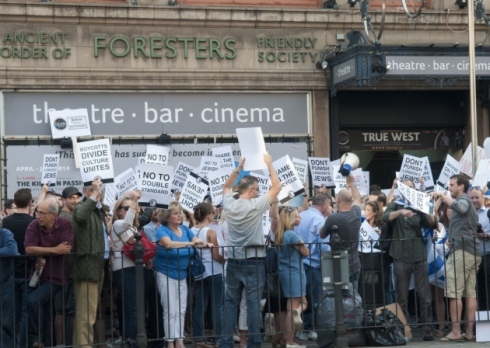 Simon Johnson, Chief Executive Jewish Leadership Council and Gillian Merron, Chief Executive Board of Deputies said they were "appalled by the decision of Tricycle Theatre Company to boycott the UK Jewish Film Festival”. "The event is a celebration of global Jewish culture and is inherently apolitical. This decision is shameful and shows that boycotts of Israel inevitably lead to the harassment of Jewish culture and individuals across the world." Actress Maureen Lipman said in a statement that it was a "punishment" of Jewish people. "The Tricycle theatre under Nick Kent had a stunning history of truthful story telling," she said. "A great part of its support and its audiences came from the Jewish sector. We always knew that even if we disagreed with the message, we accepted that it came from a reasoned and balanced argument. "Today that ceased. The Tricycle have decided to punish Jewish people in the Diaspora for one view of what is taking place in the Middle East and that is quite unacceptable." But the decision was defended by Sir Nicholas Hytner, director of the National Theatre. "I greatly regret the UKJFF’s decision to leave the Tricycle cinema," he said. "Indhu Rubasingham and the Tricycle board could not have made clearer their commitment to Jewish culture or their desire to host a festival that would have included films from all over the world, including Israel. It is entirely understandable that they felt obliged to insist that no government agency should sponsor the festival. "The Tricycle serves a diverse community with a notably diverse repertoire and it has a clear responsibility to make no statement about the dispute that is behind the current conflict. It greatly saddens me that the UKJFF have unwisely politicised a celebration of Jewish culture and I deplore any misrepresentation of the Tricycle’s position. I support Indhu Rubasingham and the Tricycle without reservation." The 2013 festival was subject to a protest by the group 'Jews For Boycotting Israeli Goods'. "We protest that our Tricycle is associating itself with a government, which regularly kills, maims, persecutes, imprisons even little children and humiliates Palestinians of every age," the group wrote in a letter to the theatre's management last year. Last week, the Underbelly theatre at the Edinburgh Fringe said it had been forced to cancel all performances of 'The City’ by the Incubator Theatre group, after anti-Israel demonstrators loudly protested outside each performance. A show by students at Israel's Ben-Gurion University of the Negev called La Karina is also set to be targeted by boycotters when they perform for four dates at the St Brides Centre.